FILE - This still image from video posted on a militant website July 5, 2014, purports to show Islamic State leader Abu Bakr al-Baghdadi delivering a sermon in Iraq. In his attack, Ibn Jubayr decried the "Iraqization" of the leadership and questioned whether the militants’ caliph, Abu Bakr Al-Baghdadi, is powerless and effectively excluded from decision-making. MEMRI researchers say over the past year, the group Ibn Jubayr belongs to — all members of the organization’s so-called Bureau of Studies and Research, which is in charge of issuing religious rulings — has become embroiled in a dispute with the organization's leadership and its media department over the esoteric but theologically significant issue about who can declare apostasy in Islam. “This is a series of articles from inside the Islamic State in which we try to expose the men who hold power in it, who have violated the path of the prophecy in their policies in order to attain benefits for themselves and to remain in their positions,” announced Ibn Jubayr. Throughout the series, he suggests Al-Haj Abdallah, head of IS’s Delegated Committee, the top executive body, has pushed al-Baghdadi aside, reducing him to being merely a symbolic figurehead. Complaints have surfaced in recent months from other quarters within IS with accounts of clashes between different factions in Syria’s eastern province of Deir el-Zour, where IS supporters have called for al-Baghdadi’s ouster and replacement. One of the reasons given was the powerhold Iraqis have on the organization, which is the subject, too, of Ibn Jubayr’s first article. “As for the caliph [Abu Bakr Al-Baghdadi], may Allah protect him, he is one of two things: Either he is kept in the dark, or he knows about this but was convinced of the necessity of this policy,” said Ibn Jubayr. 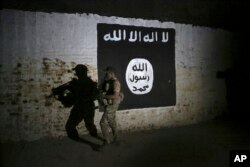 The scathing attack is reminiscent of some semi-public criticism by IS supporters in early 2016 when the terror group first started to come under serious military pressure from its foes — including U.S.-backed Syrian Kurdish forces — that eventually led the self-declared caliphate being rolled up territorially in both Syria and Iraq. IS retains a significant presence in remote and rugged areas along the Syrian-Iraqi border. In February 2016, the widow of an IS fighter voiced rare open criticism of the terror group's leaders, complaining about the treatment of widows and families of dead fighters. Her protest letter, posted online, was circulated widely on pro-IS social media sites, and she clearly had some sympathy within the organization, according to analysts, as her online complaints weren’t deleted. “Imagine that you’ve helped a sister who requested zakat [charity] two days ago, but you have ignored the sister who has been waiting a month before,” she writes. “She cries every night, concerned about how to feed her children as her husband is martyred. The tears that roll down her cheeks and the pain she suffers will be something you will be asked about and accountable for,” she added. In early 2016 with battlefield setbacks mounting rapidly, there were signs of increasing dissent and defections from IS, especially by North African recruits who complained they were treated unequally, receiving less pay and a poorer share of spoils and enslaved women. The group’s leadership responded with brute force, and there were reports of ever more gruesome executions and massacres.